This phrase has been quoted often through the years by many scientists, doctors, food specialists and even students as they do research on edible herbs, grains, seeds, plants, fruits and vegetables. The positive results of on going research and as well many studies has proven this statement to be true. But for some, the only problem believing this comes from the steady increase in diseases and sicknesses. With the abundance of healthy food out there, why isn’t there a decrease in ill health? But we have also learned that many of the diseases come from the increased use of deadly chemicals & toxins in our atmosphere, our homes and even in the foods we consume. The healthier choices we make in the foods we eat and as well the increase use of good supplements are really the best way we can fight for our health. As I thought about this new year I decided to continue to work with organic seeds, flours, vegetables and fruits, sharing these tasty recipes with family, friends and my website visitors. This passion to cook and bake using nutritious ingredients was instilled in me when I was very small by both of my grandmothers and mother. Almost all of what they prepared for us to eat came from what they grew and preserved. As a young mother myself, I started sharing many of my nutritious recipes in cookbooks that are still available today at www.winnieswinningways.ca. As well, I continue to use the website to share more recipes and health tips in newsletters and now in a blog. This new year my goal is to learn how to use the website in such a way that I am able to continue sharing healthy recipes; recipes that can help us fight the battle for good health. As our family members or friends come face to face with health challenges, I will work on creating new recipes to help them meet these challenges. This morning I decided to start the year by baking a fresh batch of healthy bread. The homemade yogurt that I had in the fridge will break down the hard to digest bran in the spelt flour. Organic spelt flour is an ancient grain that is healthier than red spring wheat. The loaves were still warm from baking when we decided to visit a sick friend and share half of this batch with them. In “EAT MORE WHOLE GRAINS” cookbook I mention replacing store bought Dough Enhancer with egg, vitamin C and vinegar. Today I just left out the Vitamin C as I didn’t have any in the house. The gluten developed perfectly and the loaves rose well. P.S. I later made another batch so I could document the amounts a bit more carefully! 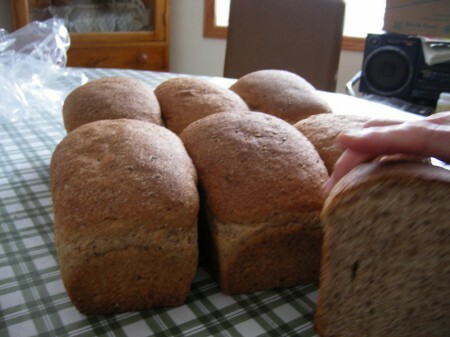 HEALTHY SPELT BREAD – I divided the dough into 9 equal pieces about 18 ounces in each. I have a convection oven so the 9 loaves are an oven full using both shelves. You can divide this recipe in half for a smaller batch. Still use 1 egg. 4 cups unbleached flour (or sift out the bran from some spelt flour and measure 4 cups of the remainder. Put all ingredients except yeast and unbleached flour into the Bosch bowl. Attach the dough hook and mix on low. Then continue to mix while sprinkling the yeast over. Add the unbleached flour. Knead 9 minutes. It will be a stiff dough that holds together tightly. Divide the dough into 9 pieces. Shape each ball into a smooth loaf, banging it on a surface to get out all the bubbles. Place in a greased bread pan. Do the same with the remained balls. Cover the loaves with a towel and let rise more than double. Bake at 350 º F. For 25 – 30 minutes or until nicely browned. Remove from pans, cool and freeze. EAT MORE WHOLE GRAINS cookbook has over 200 recipes that make baking with or without grains easy with great results. Besides the instructions to mix and knead the dough by hand, all the yeast recipes have instruction on preparing the dough in a Bosch or other dough mixing machine. From kernels of grain to 6 loaves of freshly baked bread in just 2 hours!